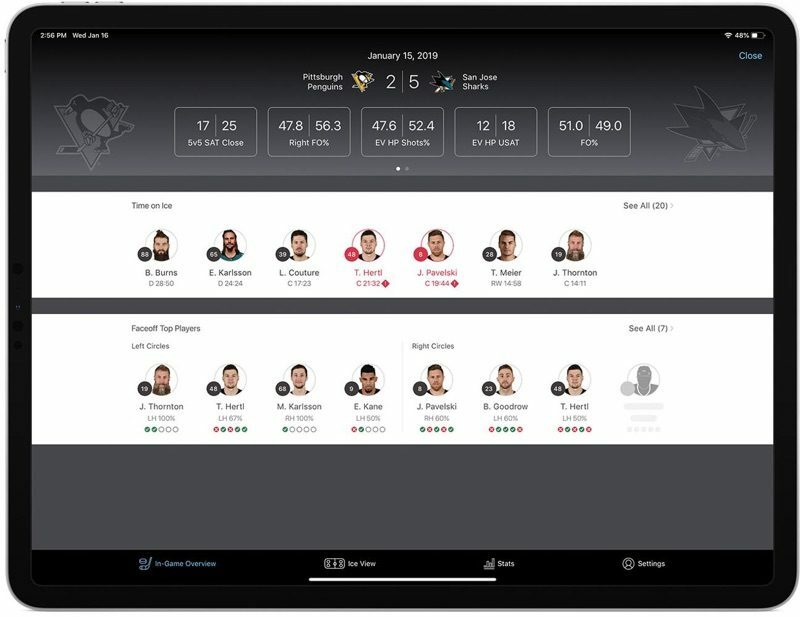 The National Hockey League today announced the upcoming launch of a new app designed for the iPad that will provide coaches with more than 60 different real-time individual and team statistics on iPads that will be available on the bench during games. The NHL is deploying a new set of iPad Pro models with the app, and the new iPad will complement the three iPads already on the bench that offer up real-time video. New iPads and the app will come out League-wide sometime after the All-Star break. Designed in consultation with video coaches from various teams, the app was built to provide coaches with player usage (time on ice) and face-offs at the forefront because that information is "most valuable" to coaches during the game. "There's a lot of information out there, but coaches are still writing it down on pieces of paper," NHL senior vice president, business development and innovation David Lehanski said. "They're not using it the way that they could use it because there really hasn't been a platform that will allow them to do it easily and efficiently and to quickly customize it to see what they want to see. We're also doing it because we're setting a foundation so that when puck and player tracking is fully live, now we've got the video, the stats and analytics app, and we can start pouring in the data to mesh with it so we have a true real time system." Face-offs are broken down by success rate per zone and side of the ice, against specific players, with a color-coded visual graphic available for how well a player has done in his last five face-offs. There's also a customizable threshold available to let coaches input time on ice for each player. Additional information like shot attempts, unblocked shot attempts, chances for and against, and success rate on shootouts with forehanded and backhanded shots will be included. The new app will be limited to coaches only, with one iPad Pro available on the bench at every game for every video coach in the NHL. The NHL will manage and store the iPad Pros, but each team will be provided with its own account. The NHL won't be able to access the customization of the stats by each team. Coaches will be provided with online training courses and a manual handbook on how to use the app most effectively during games. It's too bad Robbie Ftorek isn't coaching in the NHL any more. I'd like to see what happens when one of those iPads is hucked across the ice.